The product provides a convenient way for down-covnverting the digital HDMI or DVI output from HD camcorder, PC, etc. to analog composite video audio for regular TV display and capturing via DVR or computer. Both of its s-video output and composite video output are still amazingly good quality after converting from HD feeds. 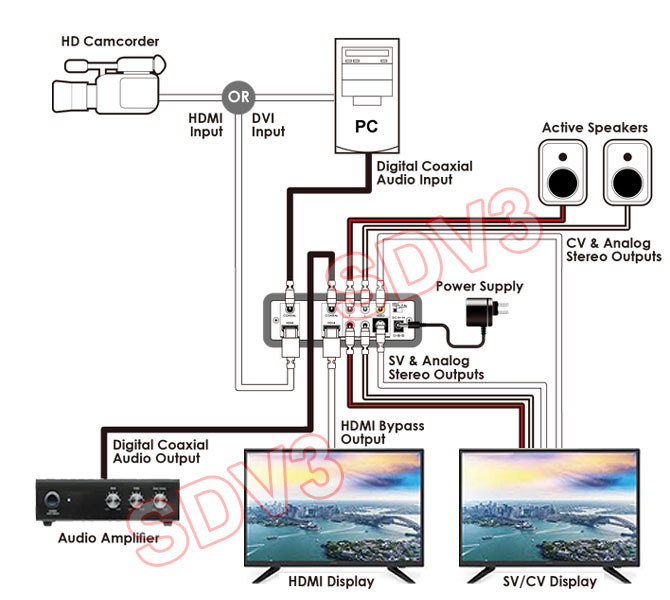 When the source is HDMI type with audio embedded, its digital audio will be converted into stereo sound and S/PDIF coax audio simultaneously for further broadcasting by stereo speaker systems, amplifier, A/V receiver or home theater system. This HDMI DVI down converter also provides a HDMI or DVI bypass to pass the original digital HD signal through for connection with HD TV display, switcher or other digital equipments. This high definition video processor provides instant down converting from its HDMI or DVI HD input to SD type in analog composite video or s-video format output so users can use a regular tube TV for watching high definition video content or video capture purpose. Its composite video output and s-video output are fully compatible with all NTSC and PAL TV systems. 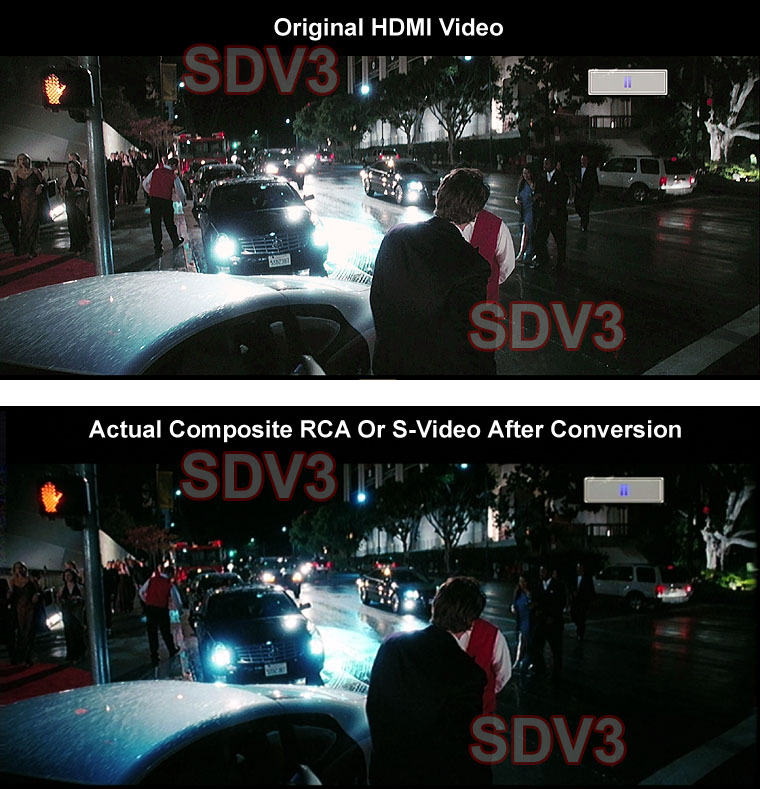 [Note]: this does not convert HDMI signals protected with HDCP. This HD video down converter is designed to convert a variety of HD resolutions from 480p up to 1080p and computer DVI/HDMI resolutions up to 1920x1200 pixels into selectable NTSC or PAL standard analog video signals at 480i or 576i resolution for all SDTV displays or video recorders. 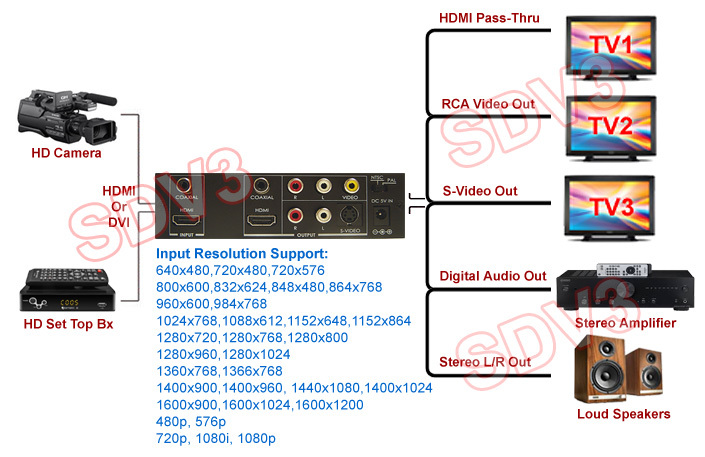 The down-converted composite RCA video output and S-Video output will retain the original high definition video quality at its best while maintaining the original 16:9 aspect ratio. No stretching and no cropping from its RCA and S-video output. By connecting the HDMI or DVI output from your HD devices or DVI-based computer with this device, this converter can deliver SD video and HD video outputs in 3 ways simultaneously including 2 standard video outputs via composite rca and s-video plus 1 HDMI pass-through for multiple TV sets, AV receivers, DVR or combination of all. In addition, the decoded stereo L/R sound and digital S/PDIF coax audio outputs from the original HDMI input can be transmitted to stereo speaker systems, audio amplifier/receivers, pre-amp or home theater systems for further distribution. This HD to SD video converter can be used as PC to TV scan converter by converting the DVI or HDMI output from a laptop or desktop PC or Mac system into composite video or s-video output to a TV or video recorder for presentation or recording purpose. This HDMI to composite s-video down converter is also backwards compatible with all DVI sources such as PC and Mac systems. This HD video down converter offers wide bandwidth capacity, ensuring that the audio and video output from this HD/SD video audio converter maintain signal quality with no loss for long distance transmission. This device is also a HDMI audio converter. 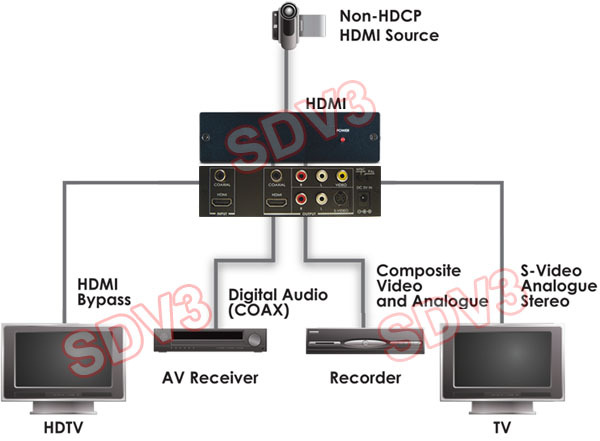 It will extract HDM audio and decode the HDMI audio into digital coax S/PDIF audio and stereo L/R outputs at the same time for hookup with stereo speakers, audio amplifier/receivers or home theater systems. If the HDMI input source has audio embedded, simultaneous audio outputs including 1 S/PDIF coax out, 2 stereo L/R outs plus HDMI audio pass-through. [Note]: This HDMI audio converter does NOT convert from its coax S/PDIF audio input into stereo channels. The coax S/PDIF input will be passed directly through its S/PDIF coax out. This HDMI supports various digital audio inputs including PCM, Dobly Digital, DTS digital audio at up to 192Khz frame rate. 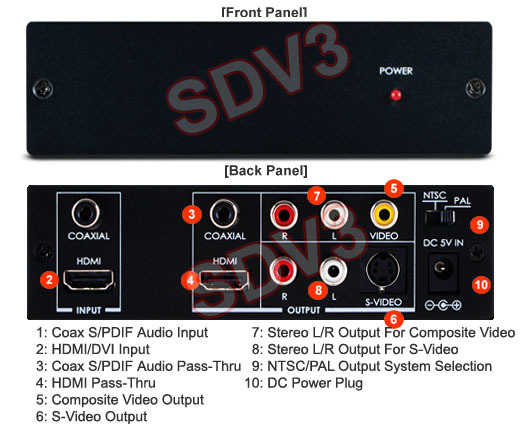 Converts HDMI or DVI video signals to analog composite video and s-video type at the same time. Selectable NTSC PAL format at 480i or 576i resolution. Served as HDMI audio converter with digital S/PDIF out and stereo RCA output. Converts HDMI audio into digital S/PDIF in coax format. Converters HDMI audio into analog stereo L/R sound in RCA format. 3 simultaneous video outputs including composite video output, s-video output and HDMI video pass-through. 4 simultaneous audio outputs including 1 S/PDIF digital out, 2 stereo L/R outs and HDMI audio pass-through if the HDMI input source has audio embedded. Digital audio interface supports PCM, Dolby Digital, DTS digital audio at up to 192kHz frame rate. Supports wide range of computer digital RGB input resolutions from 640x480 to UXGA 1600x1200 pixels @60Hz. Used as a PC to TV scan converter by converting the computer DVI or HDMI digital outputs into NTSC PAL TV signals via composite rca or s-video format for display or video capturing. Backwards compatible with all DVI input sources and output displays.